Turkish investigators believe a 15-member team was sent from Riyadh, Saudi Arabia to carry out a plot to assassinate journalist Jamal Khashoggi inside the Saudi consulate in Istanbul, reports the WashPost. The details: Two privately-owned planes believed to be carrying the men flew into Istanbul on October 2, where they stayed for less than 24 hours. Per the N.Y. Times, Turkish investigators claim they have identified all 15 men as working in Saudi government or security services, including an autopsy expert who was "presumably there to help dismember the body." 3:15 a.m.: The first plane carrying the men who allegedly waited for Khashoggi at the consulate touches down in Istanbul. 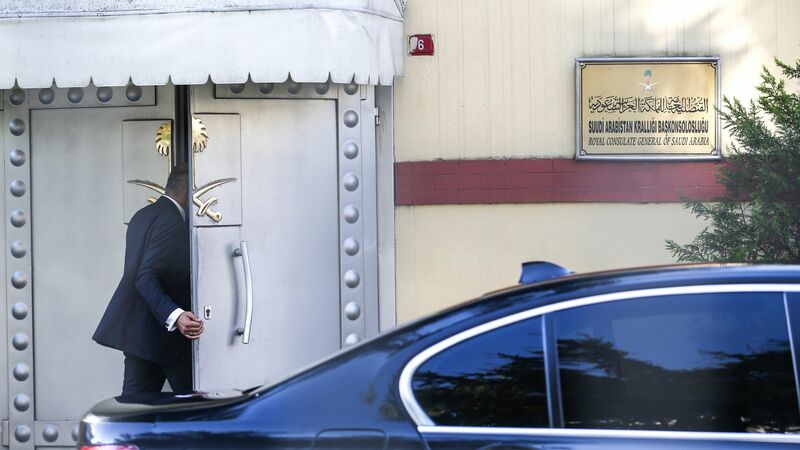 1:14 p.m.: Khashoggi enters the consulate to retrieve marriage documents. Cameras do not record him ever leaving. 3:09 p.m.: A Mercedes exits the consulate and pulls up in front of the residence of the Saudi consul general, where it reportedly remains for four hours. 5:15 p.m.: A second plane transporting the rest of the team touches down in Istanbul, though it's not clear whether those men traveled to the consulate or the residence. 6:30 p.m.: The second plane departs Istanbul for Cairo, where it remains for 25 hours before leaving for Riyadh. 10:45 p.m.: The first plane departs Istanbul and makes stops in Nallihan, Turkey, and Dubai before flying to Riyadh on October 3. What's next: Saudi officials — who claims Khashoggi left the consulate shortly after he arrived and that they, too, are worried for his safety — will permit Turkish authorities to search the consulate, per Al Jazeera. The date and time of the search have not yet been announced.